Bearcat Tailgater is proud to be involved with the "Cincy Committed to Kelly" rally towel fundraiser to support the All Purpose Jefferson Ave. Sports Complex and the Down Syndrome Association. Rally Towels will be available at all Montgomery Inn Locations, the Holy Grail in Clifton, Nothing But Net on Mt. Carmel Tabasco Rd., the Bearcat Tailgater Tailgate and various locations surrounding campus on Game Days! Your "Committed to Kelly” Rally Towel is available for a $3 donation (2 for $5). 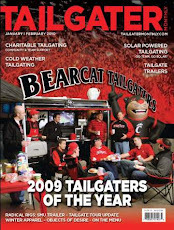 Follow www.bearcattailgater.com for updates and more details on distribution locations. If you would like to join our team please email me at bearcattailgater@gmail.com. Go Bearcats!! Akhil...if you are in town for the game stop by our tailgate lot at the corner of W. Daniels and Short Vine before the game. You can also buy them at the Holy Grail. If this doesn't work send me an email at bearcattailgater@gmail.com and I'll make sure we arrange to get you one. Thanks for the support!